I just wanted to let all know I am in Knoxville, Tn. Mark and I are teaching an Ignite marriage conference at Embassy Christian Center. We will be back late Saturday night so I will be back on here Monday! Woo Hoo! I have some really great things to share with you and can't wait. I would like to ask you to stand in agreement for the lives we will be touching this weekend. Your marriage is the most important earthy relationship you will ever have and let me tell you, it ain't easy, no matter how great your mate is. Amen Sista! 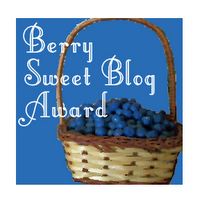 One thing I do want to share today is the Berry Sweet Blog Award I received today from my friend Kim. Kim is an amazing writer and shares not just her words but her heart as well. I will be passing it on. Thanks Kim! Hi Tina -- Hope your conference went well (I'm sure it did)! Just want to let you know how much I enjoy reading yours and Mark's blogs. I don't always take the time to write a comment, but I often print them out and use them or give to the lady who does some of our ladies meetings. Most often, what you and Mark say is exactly what I needed to hear at that time. Thank you both for listening to and obeying God. There are probably plenty more like me who are blessed by your God inspired words, but don't always take the time to tell you. I love and appreciate you both!